Do you watch the Super Bowl for the football or commercials? I’m in it all for the food! So, I have a story to tell. It’s said that the Buddha carried a bowl from village to village, collecting small offerings of food along the way. At the end of the day, he would eat his meal, enjoying a variety of flavors that ceremoniously blended together. No wonder the legend inspired the trendy name craze of a Buddha bowl for satisfying go-to meals. It doesn’t have to be a Buddha bowl or a Power bowl or an Açai bowl to be delicious. Just pack a bowl with some basics for a healthy one dish breakfast, lunch or dinner! And just FYI – this is my version of a Super Bowl! In the recipe below, I use steel cut oats but use what you’ve got on hand. Other suitable grain bases include rice, quinoa or pasta. Even veggie noodles will satisfy. 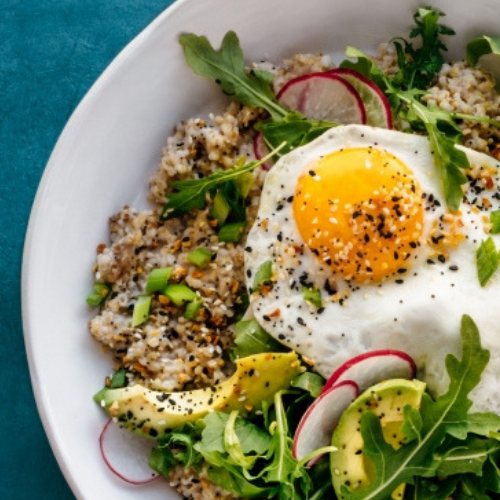 This bowl is packed with greens including arugula and avocado for some of that healthy fat. I thinly sliced radish to add a little extra space, but mostly to make this bowl look pretty with those beautiful splashes of red. You can try any other fresh vegetables you have on hand. Try a fried egg or go for toasted chickpeas to keep it vegan. Seafood or some other cubed-up leftover chicken, beef or any protein will also do just fine. Sprinklings like the everything bagel spice mix, which also happens to go with everything, adds extra nutrients, crunch, texture, protein and flavor. You can also sprinkle your bowl with sunflower seeds, hemp seeds, sesame seeds, other chopped nuts and so much more. What’s a bowl without making a little dressing? You can be as simple as a little extra virgin olive oil and lemon, or a quick take a nut butter dressing like the one I’ve shown below. Make the oatmeal: in a small saucepan, add oats, broth and salt and bring to a boil. Turn heat down and simmer until the oats soften, about 20 minutes. Make the OJ drizzle: in a small bowl, whisk together all ingredients with a fork until combined. Add hot sauce, salt, and pepper to taste. Make the egg: heat olive oil in a frying pan with a lid over medium high heat. Add the egg, sprinkle with salt and cook until egg white turns opaque. Add water and cover pan; turn heat to low and cook until the whole egg turns opaque, about one minute. To serve: in a bowl, layer oatmeal, greens, radish, egg, avocado, and scallions. Top with OJ drizzle and finish with a generous sprinkle of everything bagel spice mix.